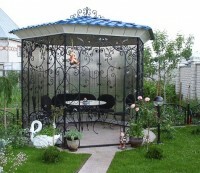 The gazebo is the most popular garden building, which is used for recreation. 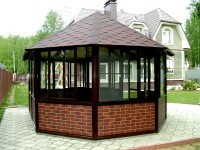 Today, the gazebo can be made of natural stone, wood, brick and metal. In the relevant galleries you can see photos of the pavilions from different materials. It should be noted, most durable are stone and brick gazebo. Behind them are already metal, and, in the end, wooden. Despite this gazebo made of wood are the most attractive and easiest to create with their hands. All content on this site SamDizajner.ru written specifically for Simdesigner, copying 1 in 1 strictly prohibited. Reprint, full or partial rewriting of the article “Gazebo made of natural stone”, possible, only when you specify the full, active link to the source.